"I created this recipe to taste like a mushroom sandwich we served at the Good Earth Restaurant in Santa Clara, California (which is no longer in business). 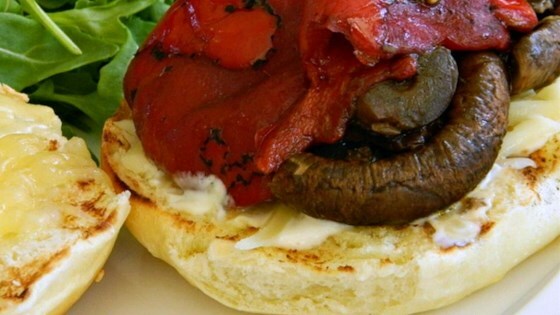 It tastes great with marinated portobello mushrooms, roasted red bell peppers, smoked gouda cheese, and spring mix!" Whisk together olive oil, balsamic vinegar, and garlic until well blended. Pour over mushroom caps in a resealable bag to coat, then seal and allow to marinate for 30 minutes. Stir together mayonnaise and orange juice, and set aside. Remove mushroom caps from the marinade and shake off excess. Place each mushroom cap upside down on a square piece of foil. Place roasted peppers on top, and seal. Cook on preheated grill until tender, about 15 minutes, turning occasionally. When the mushrooms are nearly done, cut open the sourdough rolls and grill until golden brown on the cut sides. To assemble the sandwiches, spread the cut sides of the rolls with orange mayonnaise, and layer with mushroom, roasted pepper, Gouda cheese, and the mixed greens. Very tastey! Oddly, the roasted red pepper, smoked gouda and citrus mayo also make a delicious sandwich with a fried egg. Turned out great! First time I ever followed a recipe and they were very easy to make. Will make them again for myself. We LOVED this! The combination of flavors was wonderful. I did grill a few onions and throw them on, but everything else was as written. Wonderful! !